GreenArrowTV’s Craig Byrne was recently able to sit down with Mr. Amell and talk about the show, covering topics not previously covered in the Comic-Con roundtable interview. A little bit of what Amell had to say, about upcoming villains on the show, can be found here; here’s what else we talked about. Please do not reproduce this interview onto other websites; instead, just link to GreenArrowTV! Thanks! One of the first topics that we discussed concerned Amell’s very frequent and enthusiastic interaction with fans, whether it’s on his official Facebook page (here) or on Twitter (here). “It’s super fun,” Stephen says. “It basically allows you to take a temperature of what people like. I don’t know exactly how to put it, other than to say it’s easy for me. I don’t begrudge anybody that doesn’t do it, but it feels like a part of my job, but a super enjoyable part of it. And those Q & A’s – and I’m going to do one with Colin [Donnell], and every cast member that I’ve talked to and invited to sit in, they were all like ‘yeah! Sure!’ All I have to do is post on my Facebook that I’m going to do a Q & A, pop open the laptop, get the scroll up there, click on Photobooth, record the video, upload it to Facebook, and it’s done. I do a 20 minute Q & A, and the whole thing takes 22 minutes. It’s really fun. I’d like to think that the people that are at my Facebook page and at my Twitter are not there by accident, so they are much more interactive than it would be if someone pushed 5,000 people my way, that were just there to be there. I don’t know how it’ll change going forward, but I hope it doesn’t,” he says. One thing that fans may have spotted on Stephen’s Twitter stream was a recent photo of himself with a group of friends that included another Green Arrow – Justin Hartley, who played the role for five years on Smallville. Have the Arrows compared notes? “Not really character notes or anything like that, because you’ve seen the pilot, it’s incredibly different. It’s a very different world,” Stephen says. They do, however, have mutual friends, and as they both are shooting TV shows, they have talked a bit about the basics of that. Amell also points out that a lot of the Arrow crew worked on Smallville, so they have that in common as well. “He is a good guy. He had his Arrow, I have mine, and we’ll leave it a that,” Stephen says, not wanting to take away from anything Justin had done. In fact, Amell had not seen Smallville, and had not read any Green Arrow comics before getting cast… “but now, I’ve read almost everything,” Stephen assures. 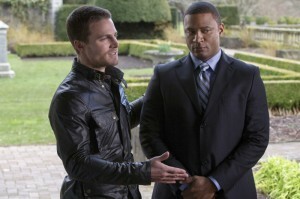 Although Merlyn and Oliver were best friends prior to Oliver’s disappearance, Oliver’s closest ally in the present day might be John Diggle (David Ramsey), a man hired to be his bodyguard that Oliver seems to have fun escaping from at every turn in the show’s pilot. Amell points out that there was more to that interaction than we see in the finished product that were cut from time, before explaining that relationship more. “Oliver has post-traumatic stress disorder. He has to, based on what he saw on the lifeboat, and what he’s going to see on the island. The first stuff that we shot on the island is brutal. You see me just get beaten down. And Diggle — [Oliver]’s got to be able to lean on somebody, and I think that it’s going to be Diggle,” Amell says. Colin Salmon plays Walter Steele, Oliver’s new stepfather. What is he like? “He’s great. He’s so proper,” Stephen says. “He’s just such a virtuous guy. We had some people over from the cast the other night, and he sang us a song that he wrote recently. He’s so involved with the state of the planet, and to listen to him talk… I can do it all day. It helps that he has this baritone voice and perfect English accent. He’s great.” It should be interesting to see how Oliver interacts with a man who has had such a large role with Queen Consolidated in Oliver’s time missing. Finally, there’s Quentin Lance – Laurel’s father, and a possible thorn in the Arrow’s side. After an accident that we’ll learn about in the series premiere, Quentin has a lot to dislike about Oliver — though on the flip side, Stephen seems to think that Quentin and the Arrow might have some common goals. “I think that Quentin Lance is my ally,” Stephen reveals. “They are after the same thing. They’re just going about it in different ways. Now, that’s the Arrow-Lance relationship. The Oliver-Lance relationship is super important, because it’s critical that Oliver knows what he did, and he wouldn’t ever expect forgiveness, and probably, if he wasn’t being boisterous, would expect contempt. That’s so layered. I love acting with Paul Blackthorne. He was my favorite villain on 24. I have never been more excited for a casting, when I saw him get cast. More than anybody else on the show. I was geeking out! He really brings it. I love working with him,” Stephen says. 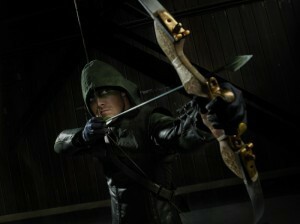 Arrow premieres October 10 on The CW. Be sure to follow @GreenArrowTV on Twitter for more updates and if you want to read some of our other Arrow interviews, they can be found here.